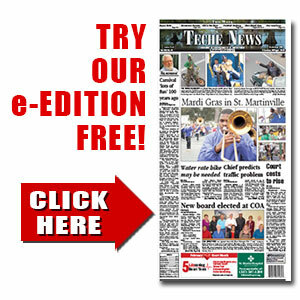 Jack Noé Huval | TecheToday.com | Teche News | St. Martinville, La. Lafayette – Jack Noé Huval, 90, passed away Monday evening, Nov. 6, 2017, at his residence in Lafayette, with loved ones at his side. An 11 a.m. Mass of Christian Burial was held on Thursday, Nov. 9, 2017, at St. Genevieve Catholic Church in Lafayette, and interment was in Calvary Cemetery. Reverend Andre Metrejean, pastor of Our Lady of Lourdes Catholic Church in Erath, served as celebrant of the Mass and conducted funeral services. Jack was born on March 13, 1927, in Cecilia, and later was a resident of Lafayette for 67 years. Jack was an attorney until his recent retirement. He proudly served his country as a member of the U.S. Navy, serving in World War II. He witnessed the ending of the war in the Pacific from a boat parked next to the USS Missouri and flew a SB2 over the aftermath of the bomb. With a kind and loving heart, Jack was a wonderful son, husband, brother, uncle and friend. Jack was known for his infamous Friday lunches in his office downtown with many local lawyers. He loved the outdoors and knew the Henderson Swamp like the back of his hand. He will truly be missed by all who knew and loved him. Jack is survived by his sister, Dorothy Blanchard and her husband, Vernon; two brothers, Carl Huval and Teddie Huval; and many nieces and nephews. He was preceded in death by his wife, Elaine “Lou” Guidry Huval; parents, Noé Huval and Ada Angelle Huval; a sister, Adele Angelle; and three brothers, James, Eric and Earl Huval. Honored to serve as pallbearers were Scott Huval, Scotty Huval, Vernon Blanchard, John Frey, Greg Guidry and Easton “Skip” Dupuis. Honorary pallbearer was Luke Menard. A heartfelt appreciation is extended by the Huval family to Jack’s sister Dot and his sitter Elaine Coles, who provided loving care for him during his illness. Visitation was observed in Martin & Castille’s downtown location on Wednesday from 1 p.m. until 8 p.m. and Thursday from 8 a.m. until time of service. A Rosary was prayed for Jack’s soul at 7 p.m. in Martin & Castille Funeral Home. Memorial contributions can be made in Jack’s name to Community Care Hospice, 123 Westmark Boulevard, Lafayette, LA 70506. View the obituary and guestbook online at www.mourning.com. Martin & Castille-DOWNTOWN, Lafayette was in charge of arrangements.